Yesterday, Leon and I took part in Cologne's first ever official 24-hour-comic event at a local comic book store/comics foundation. This is page 1 of my comic, which unfortunately has only twelve pages instead of the 24 you should complete in such an event. Nevertheless, you can download the comic here (PDF, 10 MBytes). 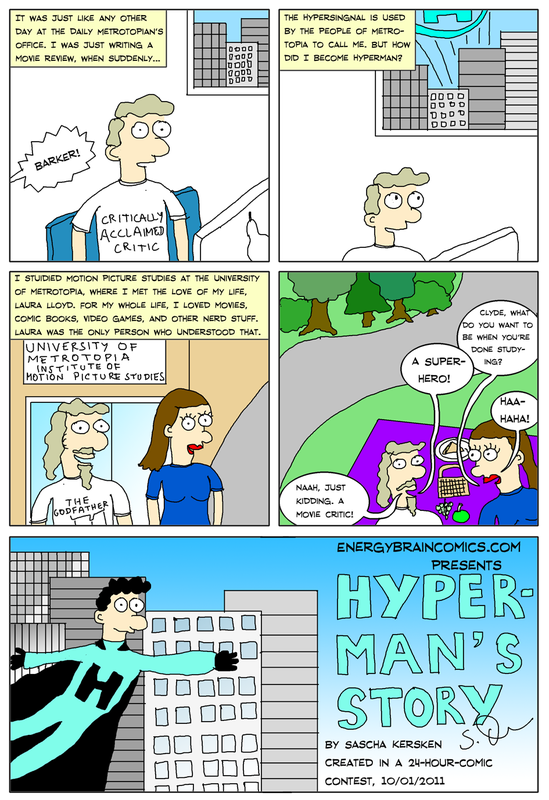 It's Hyperman's origin story. Leon DID in fact finish his 24 pages, and he even was the first one to do so after about 15 hours! His work is on paper, and I'll only be able to scan it next week. Thanks to Miguel Riveros for organizing the event and to the Cöln Comic Haus for the beautiful and inspiring location. In EBC #94, the Hypersignal is orange. I guess it can change its color, just like Clyde's hair.